At the memorial gathering Saturday for Robert Guskind, founder of the Gowanus Lounge blog, much was made of Bob's role as a mentor to other writers, photographers, and chroniclers of Brooklyn. Others mentioned Bob's important role as a journalist with professional training offering an alternate voice via blog, especially given that so much of Brooklyn is neglected by the media. And, as I've said before, Bob's passing is especially untimely, given the purchase of the independent Brooklyn Paper by Rupert Murdoch's News Corporation, and the likely consolidation, at least in part, with the Murdoch-owned Courier-Life chain. So I'll try to channel the spirit of Bob's notoriously scathing GL Analysis, liberal in its use of boldface for emphasis, in assessing the self-congratulatory coverage in this week's Brooklyn Paper and Courier-Life of the two papers' move into new offices in Metrotech. Would you believe that the Brooklyn Paper, which once flailed its rival as being owned by "billionaire moguls who have no interest in local news except maximizing classified ad sales," headlined its article We're so happy together! All it took was the ceremonial severing of a bright red ribbon by Borough President Markowitz and it was official: The Brooklyn Paper was welcomed into its new offices at the Metrotech complex in Downtown. Isn't that sweet. Isn't that the same Borough President who the Brooklyn Paper criticized last September as "hurling McCarthyite smears against the working press" rather than answer questions about his dubious charity? And is there no need to mention any more that the Courier-Life publishes Markowitz's Brooklyn!! promotional publication? Markowitz and News Corporation Senior Vice President Les Goodstein (pictured) did the honors, along with a panoply of dignitaries. So as of now, we’re happily ensconced with our colleagues from other News Corporation-owned Community Newspaper Group, which comprises more than 50 newspapers, periodicals and specialty magazines, including Courier Life Publications, TimesLedger Newspapers and Bronx Times Reporter. How happy are they going to be if the Community Newspaper Group, which already closed the Greenpoint Courier, continues to close newspapers? After all, the classified and production staff from the TimesLedger chain serving Queens are now operating from MetroTech. The apparent gains may conceal some losses--er, efficiencies. And, of course, there was no mention of the new landlord: Brooklyn's most powerful developer, Forest City Ratner. While the Brooklyn Paper, with limited space, tends to be clever and snappy, the Courier-Life chain, with more space to fill, pretty much printed the press release, with not one but two photos. At least there was no claim to be "happily ensconced." Community Newspaper Group - a News Corporation company - made its debut at One MetroTech Center North with a grand opening attended by an elite roster of area dignitaries, industry officials and representatives of local institutions, who helped welcome the ever-expanding newspaper and publications conglomerate to the borough's commercial epicenter. 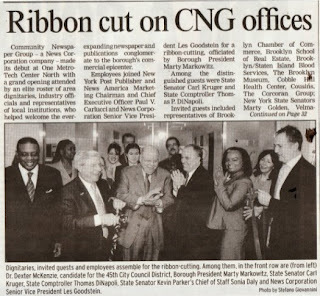 Employees joined New York Post Publisher and News America Marketing Chairman and Chief Executive Officer Paul V. Carlucci and News Corporation Senior Vice President Les Goodstein for a ribbon-cutting, officiated by Borough President Marty Markowitz. What's curious is who exactly showed up. The logic-challenged State Senator Carl Kruger, a powerhouse in Southern Brooklyn, where Courier-Life publications circulate well, and a recipient of campaign funds from the Ratner family, got prime spot in the photo and the press release. Among the distinguished guests were State Senator Carl Kruger and State Comptroller Thomas P. DiNapoli. Invited guests included representatives of Brooklyn Chamber of Commerce, Brooklyn School of Real Estate, Brooklyn/Staten Island Blood Services, The Brooklyn Museum, Cobble Hill Health Center, Cousins, The Corcoran Group; New York State Senators Marty Golden, Velmanette Montgomery, Kevin Parker and Diane Savino; The Hutch, Brooklyn Public Library, Fillmore Real Estate, JPMorgan Chase, All Car Rent a Car; Assemblymembers Steven Cymbrowitz, Alan Maisel, Joan Millman, Felix Ortiz, Nick Perry and Hakeem Jeffries; Long Island College Hospital, BRIC, New York City College of Technology, Palo Santo Restaurant, Councilmembers Vincent Gentile and Albert Vann, Brooklyn Chamber of Commerce, Prospect Park 200 Aquarium, Rep. Jerrold Nadler, Long Island College Hospital, CitiBank, Harbour Abstract, Aviator Sports & Recreation, HealthPlus, Parents Helping Parents, Brookdale University Hospital and Medical Center, AFL Webprinting, 651Arts of Ft. Greene, Brighton Neighborhood Association and New York City College of Technology. Well, which of them showed up? And why weren't some other local officials and organizations invited? How many of those elected officials have just decided they can't piss off the now-dominant newspaper chain by cooperating more with one paper rather than the other? Community Newspaper Group publishes more than 30 newspapers, periodicals and specialty magazines. It comprises the New York media companies Courier-Life Publications, which publishes this paper; TimesLedger Newspapers, Bronx Times Reporter and The Brooklyn Paper. News Corporation is the world's leading publisher of English-language newspapers, with operations in the United Kingdom, the United States, Australia, Fiji, Papua New Guinea, and across Europe and Asia. Rupert Murdoch is the chairman and chief executive officer. But will the newspapers owned by Mr. Murdoch ask hard questions or, say, criticize the iconography in advertising by their landlord? We know, at the least, that they won't ask such questions of each other.